Admire the craftsmanship but try not to watch too closely. 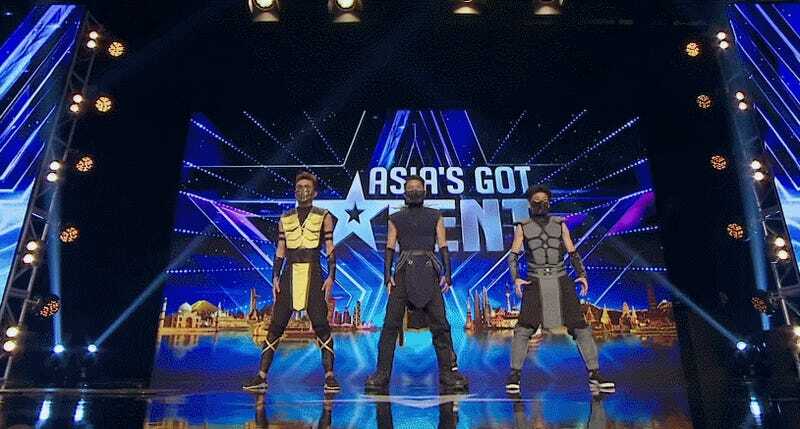 Appearing on Asia’s Got Talent, the Adem Dance crew out of Kyrgyz Republic took the stage recently in a gold buzzer audition to try and wow the judges with a performance where the Mortal Kombat costumes turned out not to even be the weirdest part. With Raiden playing Smoke, Sub-Zero, and Scorpion like marionettes, the dancers contort their bodies and twist their limbs to the beat of some vanilla dub step remix in which the game’s famous “finish him” fatality introduction is occasionally sampled. The audience was shocked, the judges were shocked, and so was I once I paused the video and actually saw what the performers were doing. At a glance they simply look synchronized, but upon closer examination you can things moving in ways that definitely shouldn’t be moving. The group has a number of other videos of their work you can watch on YouTube, but Mortal Kombat is definitely a re-occurring theme.